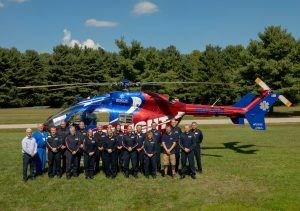 The Memorial MedFlight medical team consists of certified flight nurses and certified flight paramedics skilled in managing critical care patients and life-threatening emergencies. These highly trained specialists provide a vital link in the continuum of care for patients with a wide range of medical conditions. Memorial MedFlight respects the care and expertise you provide for your patients. Our air medical team will carry on that level of commitment during transport, and supply you with timely patient follow-up. Memorial MedFlight pilots have training and experience that exceed industry and Federal Aviation Administration standards. The entire flight team has completed intense, special training in all aspects of critical care air transport, and participates in ongoing audit and review, continuing education and critical skills validations. Supervision and oversight of medical operations are performed by the air medical director, along with the program manager and a multi-disciplinary air medical transport committee of physician specialists.